With so many spectacular countries in South America to explore, how do you pick just one? Dave and Barb’s solution: they created their dream trip to three; Argentina, Chile and Peru. 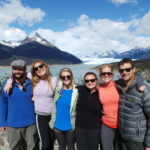 With the help of Knowmad’s travel experts, they were able to craft a custom 26-day itinerary including time in Patagonia, the Sacred Valley, Valparaiso and more. Read on to see photos and a day-by-day breakdown of their incredible adventure. Combining parts of our Classic Machu Picchu Trip and the Argentina & Chile Adventure Trip, Dave and Barb were able to get the best of three very unique countries. The rich culture and history of Peru, the cosmopolitan charm of Buenos Aires, the pristine, rugged beauty and adventure of Patagonia – even a stop in Chile’s Central Valley, a must-visit for wine connoisseurs. 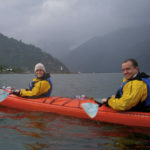 With a focus on detail and almost a month on their hands, Dave and Barb’s South America vacation was an epic journey. With highlights including Machu Picchu and the Sacred Valley, the Perito Moreno glacier, Torres del Paine National Park, and the Casablanca Valley, this is one trip they will never forget. Below you will find photos and an itinerary detailing each day of their adventure. If you would like to see even more pictures of their extraordinary vacation take a look at the photo album, “Out of This World Argentina, Chile + Peru Adventure Trip” on our Facebook page. 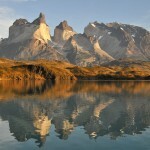 Are you interested in traveling to Argentina, Chile or Peru (or all three)? 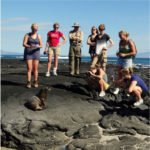 We’re regional experts here at Knowmad Adventures and pride ourselves in building custom trips that are a perfect fit for our travelers. If you’re interested in crafting an adventure to South America, but this particular itinerary doesn’t strike your fancy, don’t hesitate to reach out to our Trip Specialists at 612-394-2894 or travel@knowmadadventures.com to begin planning your trip today! You will fly from the USA to Lima arriving at 11:40 p.m. Upon your evening arrival to Lima you will be met at the airport and assisted in crossing the street and checking in to the hotel adjacent the terminal. You will be met in your hotel lobby at 7:30 a.m. and assisted in checking in for your flight. After your short morning flight to the former Incan capital of Cusco where Andean cultures come alive (don’t be surprised when the language doesn’t sound like Spanish – it is most likely the native Andean tongue Quechua), you’ll be met at the airport and taken for lunch. Departing for the Incan sights outside Cusco, you’ll visit the fortress Sacsayhuaman and its megalithic stone terraces; Kenko, with its carved stone surfaces and subterranean altars; the Puka Pukara fortress that protected the royal capital from attacks; and the water temple, Tambomachay. 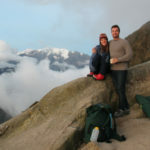 Continuing through the mountains with inspired views to the snow-capped Andean peaks descend into the Valley of the Incas and check in to your accommodations. Take the afternoon to unwind, explore and acclimatize. 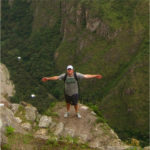 After breakfast you’ll head by van along the Sacred Valley past the communities of Calca, Coya, Lamay and Pisac. From here you go completely off the map winding up a small dirt road, which takes you through remote Andean villages until we arrive to the Amaru community. This isolated community holds strongly to their ancient customs and practices a largely subsistence lifestyle on the slopes of the Andes. The Amaru will proudly open their village to you where you will learn of their lifestyle and traditions. Among other things you take part in gathering plants used as natural dyes, learn of their medicinal and culinary properties, and see how the Amaru’s world-renowned textiles are woven and brought to life. Stay for lunch with community leaders. If still energized, you can enjoy a gentle hike through the extensive Inca terracing down the mountainside, or hop in the van, and arrive to Pisac – one of Peru’s largest and most vibrant markets – where you can bargain with Andean campesinos for hand-crafted wares. Return to your hotel for a relaxing evening. Heading out early you’ll arrive to the massive Inca agricultural terraces of Moray, thought to have been a nursery to experiment with and modify different varieties of crops. From here hike or go by van (depending on your preference, time, and weather) to the little-known village of Maras where pre-Columbian terraced saltpans are still being harvested in the traditional way by villagers. Enjoy a picnic in this surreal setting before a walk down the Andes to the valley floor where you board the train that chugs along the Urubamba River and parts of the Inca Trail towards the Amazon arriving at Machu Picchu Pueblo. Today you’ll have a half-day guided tour in one of South America’s most dynamic cities. Visit Incan architectural jewels such as Korikancha – the temple of the sun, shop at Andean markets, enjoy incredible Peruvian cuisine, and see the colonial cathedrals around the Plaza Central. You will be picked up at your hotel at 9:00 a.m. and taken to the historic San Pedro Mercado. This authentic food market is the place of choice for local Cuzqueno people to do their grocery shopping, and filled with a cacophony of sounds, vibrant colors, and pungent aromas. Explore the market alongside your chef guide learning about Peru’s diverse cuisine and ingredients while getting a real dose of Peruvian culture and meeting some of the chef’s favorite local providers. From here you’ll be taken to the chef’s beautiful open-air cooking laboratory in the countryside just above Cusco where you’ll tour the garden sipping a delicious pisco sour before the cooking instruction begins. After your interactive cooking lesson and a delicious lunch you’ll be taken back to your Cusco hotel. You will be picked up at your hotel at 8:00 a.m. and transferred to the airport in accordance with your onward flight to Lima. After arriving in the Lima airport you will be responsible for checking in and catching your next flight to Buenos Aires, Argentina. Upon arrival in Buenos Aires you will be met by a Knowmad Adventures representative and taken to your hotel in the Palermo Soho neighborhood. Enjoy the day at your leisure to independently explore Buenos Aires. In the evening you will be met at your hotel by a Esquina representative and taken to dinner and a tango show at Esquina Carlos Gardel, a venue rich in history. You will start the day by driving through the narrow streets of the old city and the broad avenues that mark Buenos Aires modern growth. On South America’s broadest avenue, 9 de Julio Avenue, you will see Colon Theater and the “Obelisco”. Around the “Plaza de Mayo” (May Square), you will see the “Casa Rosada” (Pink colored House, which houses the mythical balcony from where Evita used to address people), the Cathedral (with the mausoleum of General San Martín, and the “Cabildo” (Town Hall). Then continue your way through May Avenue, that joins the “Plaza de Mayo” to the Congress, with its Art Nouveau buildings, old hotels, theaters and cafes . You continue your journey towards San Telmo, a neighborhood of bohemians, artists, antiques shops and cobbled stone streets. You will pass around Dorrego Square, where each Sunday thousands of people visit the antique fair that is held there. Then explore the neighborhood of La Boca, with its colorful tenements, where a lot of artists open their studios and workshops. You will walk along the mythical street of “Caminito” then continue your visit in Puerto Madero (formerly: “The Docks” port area). In constant development, this gentrified neighborhood was totally redesigned in the nineties. Its new residential area, very close to the river, houses three design hotels, chic restaurants and exclusive apartment buildings. You will then head towards the north where you will stop at San Martín Square, surrounded by elegant buildings with French architecture, and one of the most aristocratic areas of Buenos Aires. Next is the traditional neighborhood of Palermo, strolling along its large parks, rose gardens and lakes, the porteños (locals) favorite place to practice sports or go for long walks. You will end your exploration in Recoleta district, one of the most fashionable parts of the city, which includes South America’s most opulent and extraordinary cemetery, the resting place of Eva Peron. In addition to this you will have the opportunity to visit the impressive Colon Theater as well as a museum that you will decide upon with your guide. DAY 12 Buenos Aires Enjoy the day to independently explore Buenos Aires. You will be have a Knowmad surprise which will be communicated by our local coordinator Veronica; please leave your dinner plans open. You will be picked up after breakfast and taken to the airport for your late morning flight to El Calafate. Upon arrival in El Calafate you will visit the Glaciarium Museum of Ice. Glaciarium is a modern interpretation glaciological center, and one of the few Glacier Museums in the world. It focuses on the appreciation and understanding of glaciers and their environmental impact. The exhibits include models, dioramas, photographs, screens, interactive representations, a 3D documentary, and other modern resources that provide an enriching experience. If you have time after your visit, head for a drink at the ice bar made completely of ice. After breakfast, you will be picked up at your hotel (specific time to be decided with guide day previous) and taken to the Perito Moreno Glacier. Spend the day visiting the various scenic overlooks and viewpoint areas of the massive Perito Moreno Glacier. It descends to Argentino Lake and its 35-kilometer long and 70-meter (230 ft.) high wall above water level can be admired, with vibrant colors ranging from white to turquoise. You will also be able to take an hour long boat ride to and along the face of the glacier for an up close and personal experience. Following this full day at the glacier you will be taken to your hotel. You will be picked up from your hotel by an Explora representative between 7:00 a.m.- 7:30 a.m. and taken by vehicle to Cerro Castillo (Chilean/Argentinean border) while driving through rolling grasslands and classic Patagonian landscapes, and onward into Chilean Patagonia arriving to your lodge in Torres del Paine National Park. While at Explora Salto Chico you will be able to choose from a wide range of adventurous excursions, as well as enjoying gourmet food and a range of wines and alcohol as part of their adventure inclusive package. For more information on excursions please see the supplementary information from the lodge. An Explora representative will take you to the airport in accordance with your onward flight to Santiago. Upon arrival in Santiago you will be met by a Knowmad Adventures representative and transferred to your hotel in Valparaiso. You will be picked up at 10:00 a.m. to enjoy a full-day excursion of Valparaíso, which is a must see for any visitor to Chile. A UNESCO World Heritage site and one of the first Chilean cities founded by the Spanish, Valparaíso was the most important Pacific South American seaport for centuries until the inauguration of the Panama Canal. In its Golden Age, the city was a thriving hub of high society, culture, and European influence. Today, those historic elements are mixed with quirky, bohemian cafes, artists’ workshops, and street art to create a city full of character and with surprises at every turn. You will explore the historic downtown sector, and then century-old hillside ascensores (elevators) will transport you up into the city’s steep hills, where a labyrinthine maze of streets reveals brightly colored buildings, hidden cafes and elegant restaurants, and spectacular views of the harbor below. Your exploration also includes a stop in the resort city of Viña del Mar, known as “the garden city” for its lush gardens and palm-lined boulevards. After exploring town a bit you will be transferred back to your accommodations. Enjoy the morning at your leisure. At 11:00 a.m. you will be met by a Knowmad Adventures representative (please have bags packed and be in lobby) and taken to La Casona at Matetic Vineyards. Enjoy a leisurely afternoon. You may arrange with the concierge a complimentary vineyard tour & wine tasting at the properties vineyard. If you would like to be more active you can choose from a range of activities offered by onsite at additional cost such as horseback riding, biking, and guided hiking. Your guide will meet you at your hotel at 9:30 a.m. to head for the renowned Casablanca Valley. Chile’s move toward cool-climate viticulture began 25 years ago when innovative winemakers dared to suggest planting in the pre-coastal Casablanca region. The valley is now world-famous for its technology and commitment to terroir, producing some of Chile’s best white wines and cool-climate reds. Your first visit will be to you will visit Kingston Family Vineyards. Since its first vintage in 2003, Kingston has been turning heads with its small production Pinot Noir, Syrah, and Sauvignon Blanc. While coastal Casablanca is known for its white wines, Kingston is pioneering the production of cool-climate, artisan-style reds. Wines from the 300 acre family ranch are handcrafted and bottled on site. Wine Spectator commended Kingston for “bringing diversity and excitement to Chile” and Wine Enthusiast heralded the vineyard as the “Sommelier’s’ New Chilean Favorite.” Loma Larga vineyards. Named “Winery of the Year 2011” by Wine & Spirits magazine, Loma Larga continues to represent the best of the Casablanca Valley. After your tour and tasting, we will head to HOUSE Casa del Vino for a special food and wine pairing lunch comprised of three courses, each served with a glass of wine specially selected to accompany the flavors of the dish. After lunch you will visit Loma Larga Vineyard, which sets the bar for quality cold-climate red wines with several award winners and consistent 90+ point ratings by such prestigious publications as Robert Parker’s Wine Advocate. You will enjoy a tour and private tasting of Loma Larga’s distinctive wines. After your day of vineyard tours you will be transferred to your hotel in Santiago. Enjoy the day at your leisure to independently explore Santiago. You will be picked up by your guide at 11:00 a.m.to embark on a guided culinary market exploration. Departing from the hotel, you will drive to the downtown center and the iconic Plaza de Armas. Here, you will learn a bit of the history of the founding of the Republic of Chile as well as discuss how the Spanish colonial past continues to influence Chilean cuisine today. Continuing through the Plaza, you will walk the short distance to La Vega Market, Santiago’s largest and most vibrant produce market. A combination of four markets, La Vega Central has been the largest market in the center of Santiago for over 200 years. Local families shop for their meals alongside buyers from Santiago’s top restaurants. Your guide will take you by a food cart for a simple but tasty sopaipilla and then on to an eatery that dishes out fresh home-cooked meals daily for a sampling of different Chilean classics rarely found at brick-and-mortar restaurants. Following your sampling, what better time to try one of Chile’s most typical drinks! You’ll taste a homemade “cola de mono” (monkey’s tail), a creamy drink usually served around the holidays, or a “terremoto” (earthquake), made with pineapple ice cream and an artisan white wine called pipeño. You’ll head out of the market on foot and cross the Mapocho River to enter the Mercado Central, Santiago’s famous seafood market, where you will witness the bounty of the Chilean seas. Mercado Central was ranked the fifth best market in the world by National Geographic in 2012. Of course, the experience will not be complete until you sample a fresh seafood empanada (alternatives available upon request) paired with a crisp Sauvignon Blanc from Chile’s San Antonio Valley. And let’s not forget the most important course in the Chilean meal, “el postre.” Chileans are experts when it comes to dessert, and the sheer quantity of diverse cakes and tarts makes it impossible to try them all. You will sample either some artisanal ice cream or another dessert spread accompanied by coffee, tea, or herbal water. After your day you will return to your hotel to pickup your luggage before being taken in early evening to the Santiago Airport to catch your onward overnight flight home.